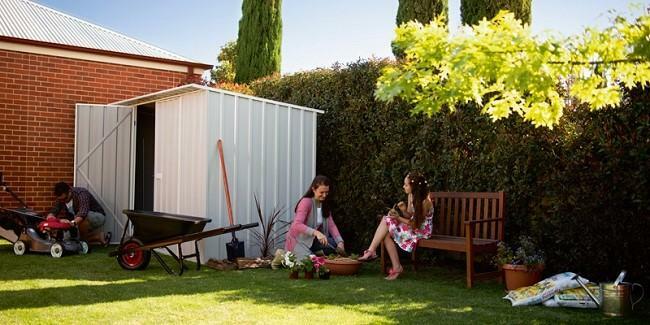 Adding a shed to your garden can be a straightforward process with many simple prefabricated sheds available for purchase that will hold all of your basic tools and supplies. However, your garden shed can also be a fun DIY project that allows you to express your creativity and unique ideas. As a small structure, you can easily add decorative details and unique features to create a beautiful space that becomes a part of your garden’s design and appeal. For cold-climate gardening, an insulated garden shed that doubles as a greenhouse will let you get a jump on springtime seed starting and will give you a cosy place to overwinter tender plants. Add electricity to your garden shed and you can heat the space for your plants or for your own comfort on chilly days. Access to electricity will also allow you to install supplemental lighting, seed starting mats and soil cables to provide adequate lighting and heating in a dark and chilly climate. When you have a dedicated space to start seeds, you will be able to get a jump on gardening so you can hit the ground running in the spring. Choosing unique features and charming architectural details to enhance your garden shed will create a decorative element for your garden that can become a part of your beautiful landscape. Adding unusually shaped windows, a steeply pitched roof, shutters and a porch will give your simple garden shed a great deal of charm. Colourful paints in a cheerful palette or a rustic, natural look will accessorise your garden based on your personal taste and style. Creating a space for potting and plant maintenance in your garden shed is essential, and a dry sink or the addition of plumbing will give you a practical working space. A workbench, compost bin, waste container and shelving for pots and tools will give you plenty of space to transplant seedling or create beautiful planters. An enclosed space in your potting shed will allow you to work comfortably on cold or rainy days to continue your progress in the garden even when the weather isn’t cooperating. Building your garden shed out of recycled materials is a simple way to keep waste out of the landfill and save money on your project. Structural wooden elements, siding, gutters, roofing materials, doors and windows are all typically available in salvage yards, and they can create a practical and functional garden shed for very little money. Your creativity in designing a garden shed based on the available materials will ensure that your shed is a one-of-a-kind addition to your garden that is environmentally friendly. Landscaping your garden shed should be very similar to the landscaping you create for your house. Paths, ornamental borders, vegetable patches and fruit trees can surround your garden shed to give it a welcoming look and tie it into your garden’s design. Adding planters, flower boxes and ornamental elements will ensure that your garden shed adds a beautiful look to your garden while serving a practical purpose. Your garden shed can be a convenient space to organise and store your harvest; you can also add a canning stove for outdoor processing during the hot summer. Inside your garden shed, you will want to create useful areas for storage, including wall hooks, workbenches, storage shelves and tool drawers. Bins for soil, fertiliser, gravel, water and other frequently used items in the garden shed will make storage simple and provide efficient access. Natural lighting is a must in your garden shed, and positioning your workbench closest to the natural light will provide you with excellent visibility when doing garden tasks. The possibilities for creating a unique and useful garden shed are many, and when you evaluate your site, your storage needs and your workspace options, you can assemble the materials and summon the creativity to create a beautiful, functional garden shed that will serve your needs for many years.